While most kids are struggling to keep from gaining weight, a small percentage are struggling to put weight on. However, when it comes to helping your child gain weight, it's important to follow the same general healthy eating guidelines recommended for all children. Filling your child's diet with fast food and sweet treats may raise calorie intake, but won't provide the nutrients necessary for healthy growth and development. Consult your pediatrician to discuss your child's needs before making dietary changes. Children need an adequate intake of calories for proper growth and development, with needs ranging from 1,200 calories to 2,600 calories a day depending on age, gender and activity. If you're child is underweight, adding more calories to his usual intake is necessary to promote weight gain. While each child is different, upping intake by 250 calories a day may result in a gain of 1/2 pound per week. Monitor your child's weight and intake and make adjustments by adding or subtracting 100 calories at a time as needed. You might be anxious for your child to gain weight quickly, but a slow and steady pace may promote healthier weight gain. Even though your focus is on extra calories and weight gain, your child still needs to eat a healthy and balanced diet to get all the nutrients necessary for proper growth and development, along with healthy weight gain. Following the same guidelines for all children will ensure adequate nutrition. That means offering a healthy mix of foods from all the food groups, such as fruits, vegetables, grains, protein, dairy and healthy fats such as oils, nuts and seeds. All of the food groups include a number of high-calorie foods that can raise a child's calorie intake to help with weight gain. Brown rice, quinoa, oatmeal and whole-grain pancakes and waffles all make good grain options for your child. Dried fruit and bananas are higher-calorie fruits and can be served as a snack. Peas, winter squash, corn and potatoes are healthy weight-gain veggies your child might enjoy with lunch and dinner. Scramble eggs for breakfast or add beans to your child's soup for extra calories and protein. With dairy foods, offer low-fat or full-fat milk and yogurt, along with cheese to help your child get more calories. Nuts, seeds and oil are a concentrated source of calories and make good calorie-boosters for veggies, grains and meats. A short stack of whole-grain pancakes with homemade blueberry compote and a glass of whole milk makes a tasty high-calorie breakfast meal for your child. 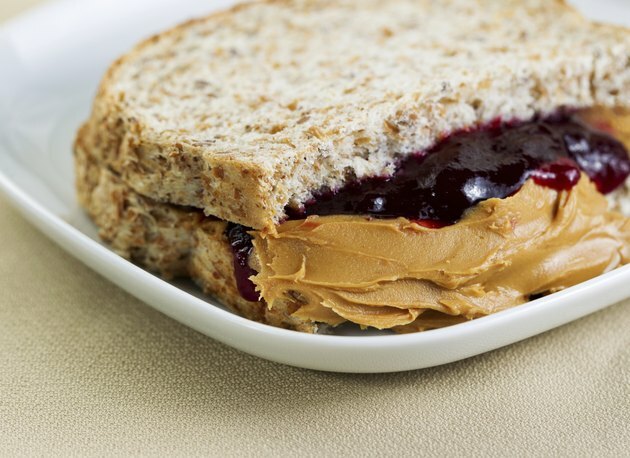 At lunch, a peanut butter and banana sandwich served with with yogurt, grapes and carrot sticks is nutritious, high in calories and kid-friendly. A cheeseburger served with sweet potato fries and corn on the cob makes a good dinner option. Snacks are an important part of your child's weight gain diet. Offer two to three a day. Good options include hummus with whole-wheat pita bread, apples with peanut butter, string cheese and whole-grain crackers, yogurt with granola, a bowl of cereal with milk or a fruit smoothie. To help your child feel part of the process, plan, shop and prepare meals together. This might encourage not only a higher calorie intake, but healthier calories too. Make meal times pleasant. If your child doesn't want to eat, don't force him. Watch your child's beverage intake if he's not hungry at mealtime. Some kids might fill up on milk or juice, which decreases their appetite for meals. Increase your child's calorie intake by adding powdered skim milk to milk, hot cereal, yogurt, pudding, mashed potatoes or soup to boost calories without affecting flavor or appetite. Each tablespoon provides an extra 27 calories.